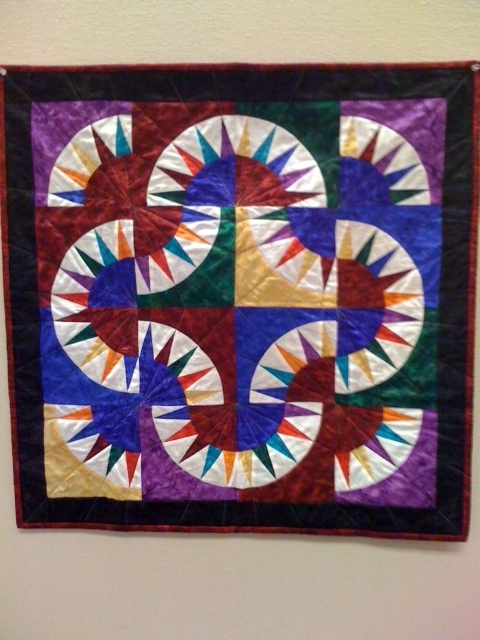 Ideas needed for quilting a Mariner's Compass wall hanging. 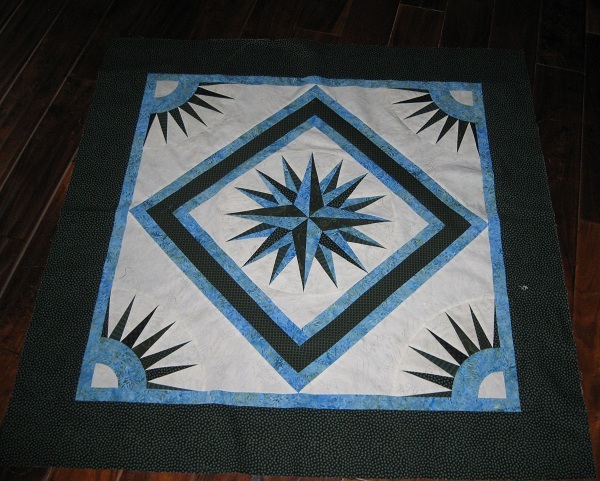 Thread: Ideas needed for quilting a Mariner's Compass wall hanging. After SITD, can you quilt out with rays to the outside edge. I am not sure of the pattern without a picture. I would do SITD in the compass to emphasize the rays, but you can do some kind of long swirl inside each ray. If it is square and you have space in the corners or all the way around the compass, you could do a feather. I did an American Beauty where I stitched the rays through the points. Here is one that I made and I plan just doing SID around the center and the corner rays with a small stipple using cream in the open areas of the corner and a larger stipple (maybe...) using green in the border. However I am looking forward to seeing what others suggest to you!! I may change my mind. IM us a picture....will have Kevin take a look and see what suggestions he has. He does SID, but definitely not his fav either! If you have some open spaces, there would be lots of room for other free motion designs. I've decided to handquilt straight lines 1/4" inside the points. And on the outside points as well. Then echo quilting around the borders. I will get a picture posted. thanks.